Babysitters are a bit thin on the ground around these parts which makes it really difficult impossible to ever get to see a movie that's isn't aimed at kids. On the whole I'm OK with that (as after having all my internet enabled devices prized from my pockets I generally sleep through most things anyway), but them came BLACK SWAN. I so wanted to see this movie in all of it's big screen glory, only to have my two arranged dates aborted due to puking sitters. So I had no choice but to soak up the many conflicting reviews from my friends and sit pretty till the DVD release. I thought that I was going to be in for a long wait, but no... BLACK SWAN comes to DVD and Blu-ray on the 29th March. Having grilled every single one of my friends about the movie I'm even more intrigued. It's been described as dark, dirty, depressing, uplifting, amazing, shocking, twisted, beautiful and inspirational. How can it be all of those things? I guess that's what makes a truly great movie. If you're as eager as I am to immerse yourself in this film sensation you really need to check out the Black Swan Experience. Sit back and view short clips from the movie and react to the emotional prompts to discover if you are a white or a BLACK SWAN. No prizes for guessing what I am..
BLACK SWAN is available on DVD and Blu-ray from Twentieth Century Fox Home Entertainment on March 29th 2011. Have you seen it? What did you think? I would love to know. Haven't got a clue what I'm going on about? Then watch the official BLACK SWAN movie trailer. Yes, I've seen Black Swan and I'm glad I did, although it's not the kind of films I'd like to watch again and again. It wasn't as shocking as I was told it was (maybe I'm tougher than I thought!) but it will reaming impressed in my memory for a long time. Worth seeing just for Natalie Portman's great performance. Ciao. 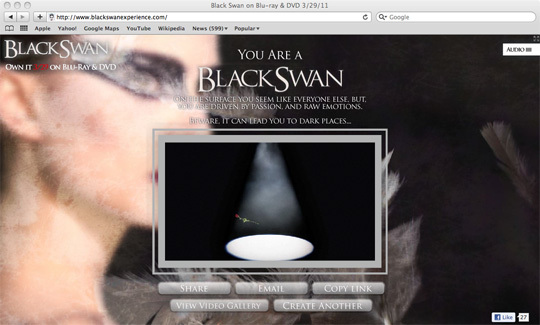 A.PS: I'm a black swan...what else? I haven't yet seen it and did serious ballet for a long time, so don't know still whether I will. My neighbour was quite shocked by it. I always want to ask - how may people (as in so many films) seriously submerge their heads beneath the water like they alway portray them as doing? My alter ego went to see it ALONE! (Fitting in a couple of spare hours whilst son did cricket nets on a Sunday afternoon). As an ex dancer, curiosity was high on the list of reasons to go - and saw it before the Baftas/Oscars. It is all of those things stated above. Incredibly powerful, moving, scary and yes, dark. Very. Go with someone if you see it in a cinema. Or be prepared to hide your head behind your neighbour's shoulder at moments. I did! I went to watch this film with my seventeen year old daughter. We were both shocked, slightly disturbed, yet at the same time, mesmerised by it. Natalie Portman is amazing and I loved it just because I adorelooking at the costumes/rehearsals, and everything which underpins a major production. Will be interested to know what you make of it. I loved this movie, I didn't know what it was about as I sat down to watch, but I'm glad I didn't, it made watching it even more mesmerising.. It was very dark, but also enlightening. Natalie Portman's performance was amazing.. I've never quite liked her in movies before. I ssinf relate to the ballet side of things, but her life, I completely got.. I see a lot of me in her pain.